Two acclaimed Philadelphia dance crews--Rennie Harris Puremovement and The Hood Lockers--are tearing up the stage at New Victory Theater, now through June 10. 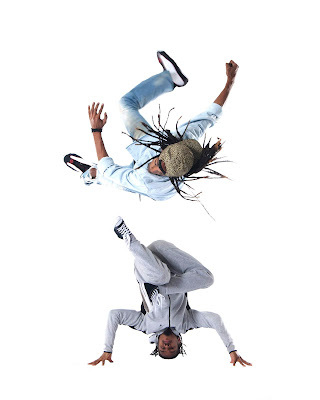 If you love popping, locking, breaking and all things street dance, go see Rennie Harris: Funkedified. The premise of this expert world premiere production is a remembrance of the funk music and dancing of the 1970s--think James Brown and Soul Train--that set Harris on his path to becoming one of the world's best-loved masters of hip-hop artistry. A marvelous five-piece band, led by guitarist Matt Dickey and drummer Doron Lev, brings the funk in a big, joyous way. Several cloth panels, hanging above the band like a quilt, capture projected imagery--some hazy, some abstract, some psychedelic--as well as Bob Steineck's luscious, saturated lighting as we hear Harris's musings on his cultural past. His voice--echoey and phantasmal--seems to emerge from out of a cloud or the depths of a dream--but the ingenious, passionate dancing and music speak for themselves. The New Vic is a family-oriented theater and, at this Saturday matinee, most folks in the audience were small kids in booster seats sitting quiet and polite throughout the show. I kind of longed for an audience of Black teens who'd know just what to do with what we were seeing and hearing! It took a while for any heads to start bopping to the fantastic music--and they were adult heads. I just hope there were youngsters in the audience checking out, in particular, Puremovement soloist Leigh “Breeze-Lee” Foaad whose fluidity, range and poignancy should prove a powerful inspiration. Rennie Harris: Funkedified runs through Sunday, June 10. For information and tickets, click here.